The junior guard and his fiancée took down the registry due to concerns over potential NCAA violations. Virginia guard Kyle Guy and his fiancée Alexa Jenkins have taken down their wedding registry down due to concerns over potential NCAA violations after the website "Busted Coverage" shared it and noted that fans might want to buy something nice for Guy after his double-double in the team's Elite Eight overtime win. The NCAA has strict regulations regarding the gifts and benefits college athletes can receive. The couple and the website were both asked to take down their posts and both complied, per the Richmond Times-Dispatch. 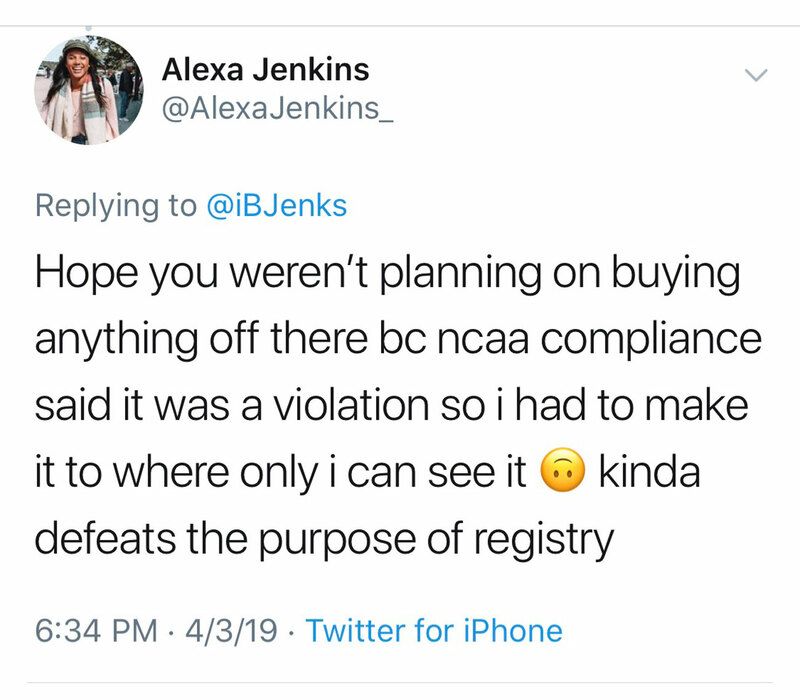 Jenkins tweeted about having to take down the registry on Wednesday in a response to another user, writing, "Hope you weren't planning on buying anything off there bc [sic] ncaa compliance said it was a violation so i had to make it to where only i can see it." When Sports Illustrated's Andy Staples asked Guy in Minneapolis asked about the situation, Guy said he wasn't going to argue with it right now but did confirm that the couple were asked to take it down, although he did not confirm by who. "That was crazy to me that that's illegal because that's what a registry is for," Guy told reporters on Thursday. "NCAA said it was illegal so I'm not going to argue with it right now. I'm going to try and win a national championship and then we'll open that book." NCAA president Mark Emmert said the NCAA did not ask Guy to take the registry down but school compliance departments often act with an abundance of caution when it comes to potential violations involving their players. "Nobody in the NCAA said anything of the sort," Emmert said. "We don't know what the source of that info was, whether it was from the team. We reached out to the institution to find out what transpired," Emmert said. Emmert said gifts from family and friends at a wedding are not against NCAA rules. The junior shooting guard from Indianapolis is the top-seeded Cavaliers' leading scorer this season at 15.2 points, 4.6 rebounds and 2.1 assists this season on 44.6% shooting from the field going into Saturday night's Final Four clash with No. 5 seed Auburn. Guy proposed to his fiancée last spring. The two are set to be married this summer. Virginia will tip off against the Tigers at 6 p.m. ET.